Yesterday, the Senate Finance Committee voted down two amendments that would have added a public option to the committee's health reform bill. The committee also tacked on millions for discredited abstinence-only-until-opposite-marriage teaching. On the bright side, maybe kids will start ditching church now that they get their nonsense free from the government, instead of at church where you have to throw in to the collection plate to hear the sermon. Vic, originally uploaded by Lindsay Beyerstein. CAMBRIDGE, MA. 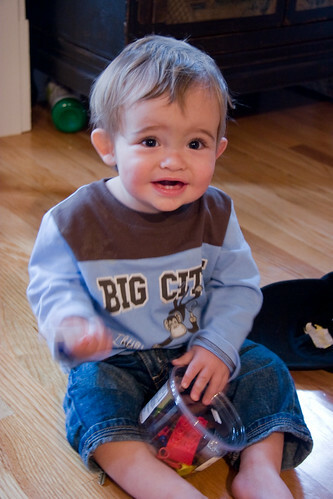 Jed and Nina's son Vic, age 1. DJA and I went to Boston last weekend to celebrate Travis's birthday and meet the Vickster. Census-taker Bill Sparkman was found hanging from a tree in a cemetery with a noose around his neck and the word "Fed" scrawled on his chest. The authorities haven't determined whether the death was a homicide or a suicide. Richard Benjamin asks whether Sparkman was a casualty of Methland, USA or a victim of anti-government bile. That's a false dichotomy. If Sparkman was murdered, whoever killed him committed an act of political violence. It doesn't matter whether the killer was also trying to protect a drug operation. The perp took a page out of the old fashioned lynching playbook--stringing up the victim and defacing his corpse as a warning to others. Clearly, whoever did this wanted to send a message. Someone who simply wanted to conceal a drug operation wouldn't dispose of the victim's body in such a spectacular fashion. We tend to think of drug traffickers as non-ideological capitalists--but it's worth nothing that the drug trade funds militias and insurgencies all over the world. Last night, I quite unexpectedly scored an exclusive video interview with Howard Dean at the 92nd St YMCA where he was promoting his new book on health reform. I asked him about the chances that Democrats will try to use budget reconciliation to pass a health care bill and thwart a filibuster. The conventional wisdom is that reconciliation is too risky. Dean begs to differ. Watch. The director-general of Unicef has been quoted as saying, “Family planning could bring more benefits to more people at less cost than any other single technology now available to the human race.” And one of the benefits of reduced population, it is claimed, is reduced carbon emissions and therefore mitigation of climate change. Mulligan's argument goes like this: i) only innovation can save us from climate change, and ii) more people equals more innovation, iii) population control would result in fewer people, therefore population control is bad for climate change. Mulligan's first premise is dubious. The consensus at yesterday's UN Summit on Climate Change was that we already know how to prevent climate change but lack the political will to act. But let's grant Mulligan his first premise for the sake of argument. The second premise is where Mulligan's argument founders. A larger population doesn't automatically translate into greater innovation. The two are probably correlated: The more humans there are, the more likely one of them will be the next Thomas Edison, Marie Curie, or Norman Borlaug. The real question, though, is whether a larger population would generate enough additional innovation to offset the extra resources required to sustain it. Mulligan gives us no reason to think so. More importantly, the innovators of tomorrow need to be educated and nurtured. Yet the most explosive population growth is taking place in the world's poorest communities. When resources are very scarce, rapid population growth may stifle innovation. Qadhafi Welcoming Committee, originally uploaded by Lindsay Beyerstein. 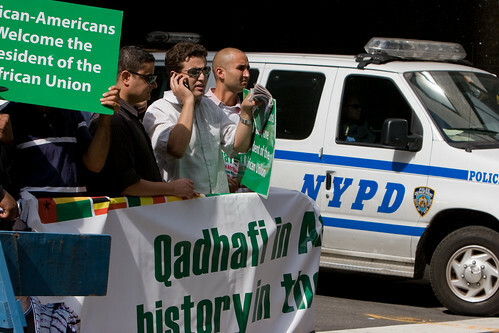 African-Americans for Qadhafi, outside the UN today. Watching Col. Ghadaffi address the UN General Assembly. He just called on the UN to investigate the JFK investigation. He speculates that "Israeli" Jack Ruby killed Oswald because JFK wanted to investigate Israeli nuclear reactor. If I heard right, he just predicted a man made "fish flu" sequel to swine flu. Tomorrow's conspiracy theories today! 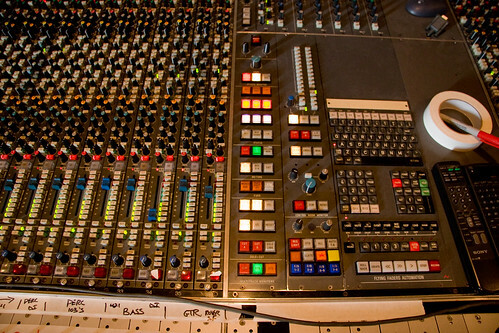 Infernal Machines: The Big Board, originally uploaded by Lindsay Beyerstein.